Whatever happened to Elvis Presley's Federal badge? Whatever happened to Elvis's Federal badge? Did he ever use it? Did Elvis, probable one of the most recognizable icons of the 50's, 60's and 70's ever use that federal badge and represent himself as a federal agent? 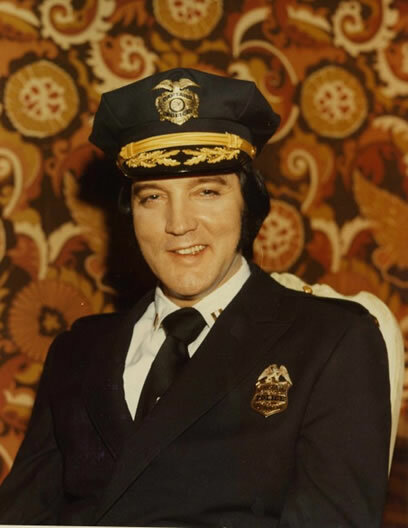 Elvis Presley collected police badges and liked to cary them around. Even liked to occasionally use them. In Dec 1970 he coveted a Federal Narcotics Badge which he believed would convey special privledges. "The narc badge represented some kind of ultimate power to him," Priscilla Presley wrote in "Elvis and Me," her memoir of life with the King. "With the federal narcotics badge, he [believed he] could legally enter any country both wearing guns and carrying any drugs he wished." In pursuit of the badge, Elvis spontaneiously travelled to Washington DC in late Dec of 1970. Wrote a note to President Nixon and personally dropped it off at the Whitehouse guard station. The letter went to Nixon deputy assistant Dwight Chapin, who got a meeting approved with Nixon's incredulous chief of staff (H.R. Halderman). After an initial security issue was handled, the two men met. The issue was, Elvis tried to enter the White house oval office carrying a weapon, a 1911 Colt 45 pistol. A present which he had brought from his home (on a commercial flight??) to give Nixon as a gift. President Nixon eventually did take the meeting. 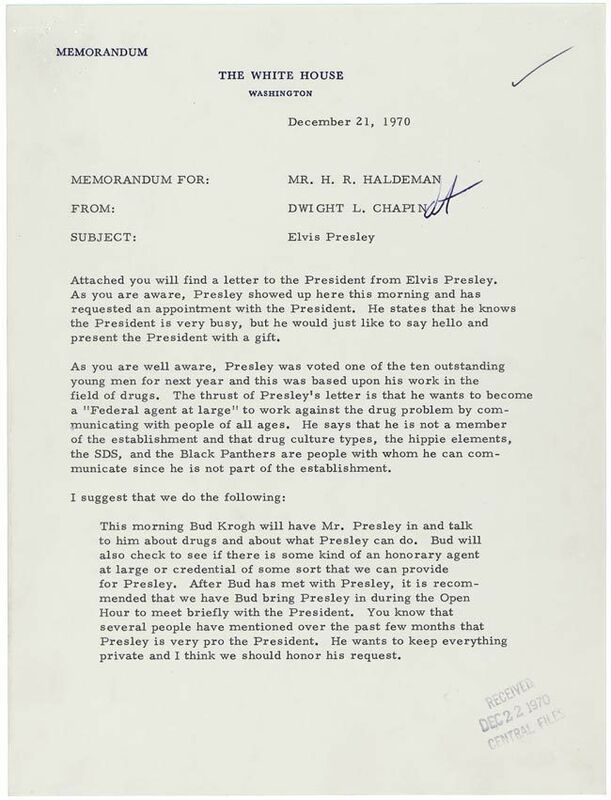 In the meeting Elvis explained to Nixon that he was accepted by the Hippie crowd and Black Panther Party. Elvis offered to go "undercover", using his fame, reputation and acceptance with America's youth and counter culture to assist the Government in handling the drug problem. All Elvis wished for in return was a Federal Narcotics Badge **("Bureau of Narcotics and Dangerous Drugs" badge). Keogh (Nixon advisor Egil "Bud" Krogh) said, "And then the real reason for the trip finally came out as Elvis said, 'Mr. President, can you get me a badge from the Bureau of Narcotics and Dangerous Drugs?' And the president looked and he said, 'Bud, can we get him a badge?' And I said, 'Well, Mr. President, if you want to get him a badge, we can do that.' He said, 'Well, get him a badge.' "
After Keogh took him(Elvis) to lunch at the White House mess, Elvis received his gift—the narc badge. Pulitzer Prize winning journalist Jack Anderson says Elvis also approached Deputy Narcotics Director John Finlator in pursuit of the badge but was declined prior to Nixon granting him the badge. Elvis also attempted to approach the FBI's J. Edgar Hoover. .
Associates say Elvis carried the badge in its leather case always. 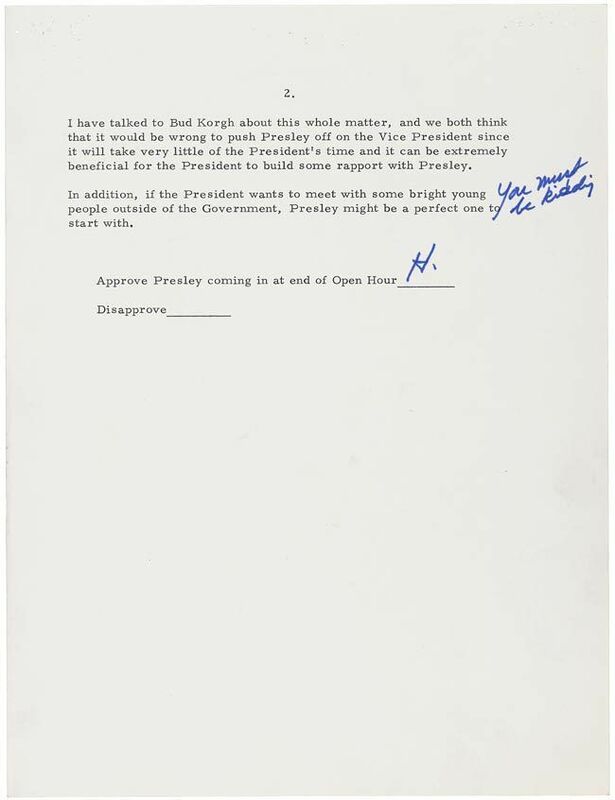 The meeting of the two became public years after Nixon left office and Elvis had died. The National Archives started receiving requests for the iconic photograph after a Chicago paper published an article about the event in the 1980's. I found these pictures of "some" of Elvis's Badge Collection which are still on display at Graceland. 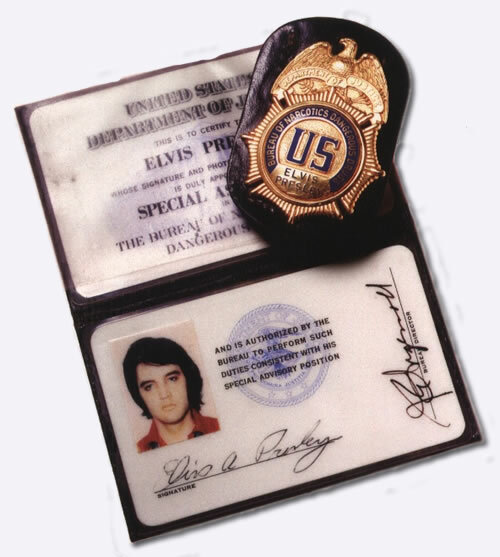 They make a special note of Elvis's Federal Badge and give the below picture, but it is not included with the collection on display at Graceland. But Elvis had some fun too, in the 1970s, he was known to actually pull over speeding drivers and flash one of his various badges and lecture them. Then, give an autograph and speed away, leaving behind a stunned person with an awesome story. To achieve this Elvis actually had a flashing blue light that he would put on the roof when required. Elvis also obtained a police radio and a revolving blue light to put on top of his Lincoln Mark IV. He began to patrol the streets of Memphis. Sometimes, listening to the scanner, he would jump on his motorcycle and make it to an accident or the scene of a crime before the police did. He would help out or direct traffic until they arrived. In 1976, Elvis lost another friend when Officer Eugene Kennedy died. Kennedy was an officer for the Denver, Colorado Police Department and brother of Captain Jerry Kennedy. Elvis postponed a recording session to pay his respects. He attended his funeral in a specially tailored Denver police captain's uniform and arranged for J.D. Sumner and The Stamps Quartet to perform at the services. Did he ever do that with his Federal Badge? I found this YouTube clip of Elvis during a performance where the video and soundtrack don't seem to match up.. where Elvis tells the crowd that he's a federal agent. "in this Video Elvis tells his Fans he is a Government Agent and they Laugh because they think he is Joking, But elvis says " Im an eighth degree black belt in Karate I'm a Narcotics Government agent" then the audience laugh thinking it's a Joke then Elvis say's " I am Swear to God".. I'm looking for an example of where he actually flashes his federal badge, identifies himself as a Federal Agent, and maybe confiscates or demands something. Something that is undeniable Elvis impersonating a federal agent. It's reportedly why Elvis wanted the badge, did he ever use it? He loved collecting badges, but that was always his favorite, as he thought it'd protect him against gun or drug charges. He died with it on his person, and it's now in a display at Graceland. I can't find any evidence of him actually using it, though he did show it to audiences at his concerts. There are records of Elvis actually using his federal narcotics badge. A man he had with him once stole some of Elvis's jewelry and then had got on a plane to leave. Elvis actually ran down the plane and pulled it over and removed the man from the plane then took him back to his house, interrogated him about the jewelry, got his jewelry back, then gave the guy $200 and bought him another plane ticket. To my knowledge that's the only confirmed use of the federal narcotics badge that Elvis received from Nixon. Not the answer you're looking for? Browse other questions tagged popular-culture or ask your own question. Did the 1962 comedy album about JFK impact the presidency or US prestige abroad?